Custom Order Prefix for WordPress WooCommerce : Custom Order Prefix for WordPress WooCommerce provides the facility to add a custom order prefix and custom order suffix also. Admin can add a prefix to the shipping method also.The Store owners often need to change order numbers either for customer convenience or to keep business information safe. In such cases, they need specific functions to make this process easier. With Custom Order Prefix Plugin, store owners can easily customize orders and shipping methods according to their needs. 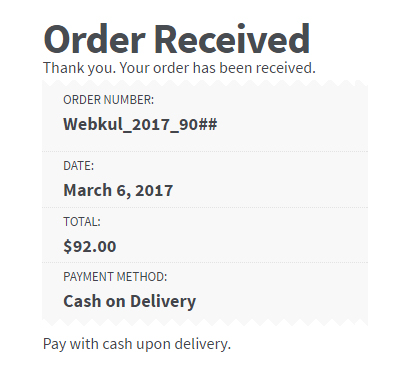 For example, you can set order numbers to start with a customized text like “Webkul_2017_”. The admin can add a custom prefix for orders. The admin can add a custom suffix for orders. The admin can add a custom prefix for the shipping methods. It supports Alphabet, Number, and Special characters also. 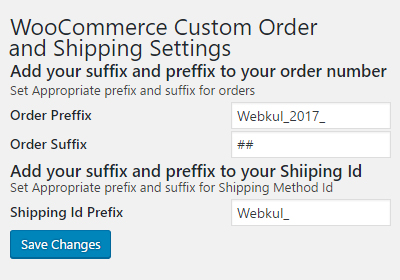 WordPress WooCommerce Custom Order Prefix allows you to add custom prefix and suffix to an order. You are also able to add a custom prefix to the shipping method. There are various requirements of a store owner to customize the order number, with the help of Custom Order Prefix you can easily fulfill them. You can add a prefix to the order. You can add a suffix to the order. You can add a prefix to the shipping method. The prefixes can help to make order IDs, and Shipment Methods identifiable to the customers and to know about the respective seller. Store owner can add custom prefixes to make the documents more identifiable. Did you buy Custom Order Prefix for WordPress WooCommerce?